Along with my New Year's resolution to use my crock pot at least once a week, I've also decided to start using my Cooking Light cook book more. That's where I found this AMAZING recipe - no joke. It is quite delicious. 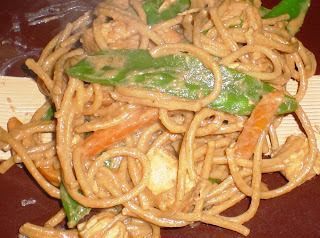 I made these Peanutty Noodles last night for dinner, had some for lunch today and STILL have a lot of leftovers. This is good though, because I'm going out to eat with my sorority alum group tonight. My husband is excited to eat this again! The original recipe is for just the noodles, but Cooking Light suggested adding chicken or shrimp to turn this into a main dish - and that's what I did! I cooked 2 chicken breasts and then cubed them. It worked out wonderfully. I can't wait to make this again (and I probably will next week!). Cut the baby carrots in half, and then in half again. Set aside. Heat 1 teaspoon oil in a small saucepan over medium heat. Add the ginger and minced garlic; sauté 30 seconds. Add chicken broth and the next 5 ingredients (broth through salt); stir until well-blended. Reduce heat, and simmer 7 minutes, stirring occasionally. Remove from heat, and keep warm. Heat 2 teaspoons oil in a large nonstick skillet coated with cooking spray over medium-high heat. Add bell peppers and snow peas and carrots; sauté 5 minutes or until tender. Remove from heat. Combine peanut butter mixture, bell pepper mixture, linguine (*and chicken) in a large bowl; toss well. Serve warm. This looks awesome. I am so making this!